To measure the lengths of your threads, take a piece and hold it from your hand to your shoulder. This is one arm’s length of thread. 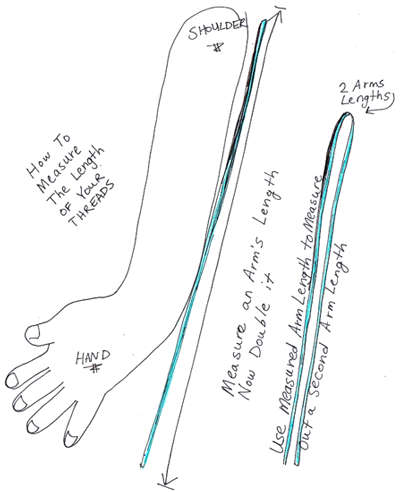 However, you need 2 arms lengths for each thread, so just use the first arms length of thread to measure out a 2nd arms length. Look at the picture above to see how I folded the string over to get the 2nd arms length. Use this first string to measure out 3 more strings. You need 4 different colors for this bracelet. Find 2 different colors of strings. You will need 2 threads from each color … each 2 arms lengths long. 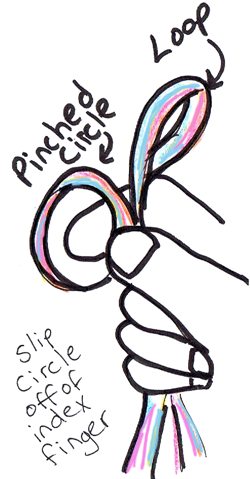 Put them each end to end and then smooth them out. 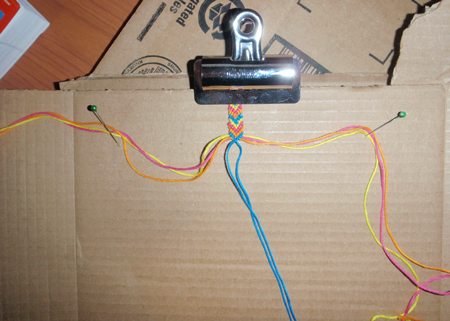 We are now going to make a loop at the end to make a clasp type feature to tie the bracelet together after it is done. 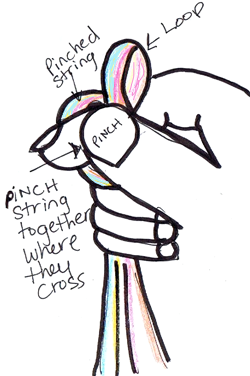 Do this by holding the top of the string in a loop and then holding a bit down with your other hand, but keeping your index finger out. 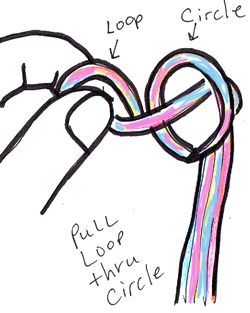 Then take the loop-holding hand and wrap the string around your index finger of the other hand. 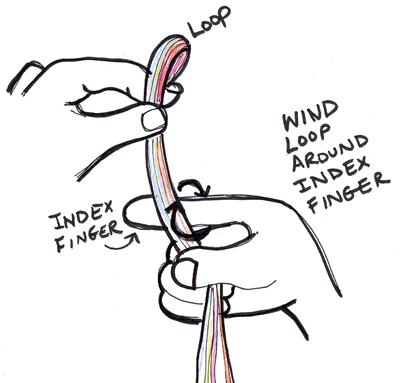 Now, with the index finger hand, pinch the circle that was just created on the index finger… pinch it where the threads cross. This is what it looks like with a real picture. Okay, now lets start. You should have 8 strings hanging out from the bottom of the loop. Spread them out like I did above…like in a mirror image. In this project, we will call the strings on the left, the left strings. We will call the strings on the right, the right strings. 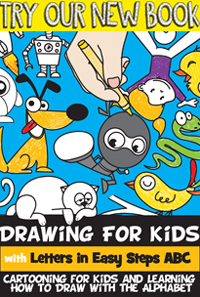 It might help you to take some crayons or colored pencils and map out your colors on paper…just the way that I did above, so you don’t get confused. Now we will start on the left side strings. Put the right-side strings up on the pin to get them out of the way. 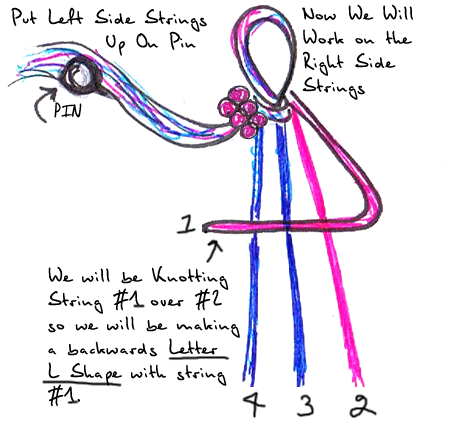 On the left side strings, we will go from left to right….so the pink string (string #1) will be the knotting string…in other words, the string that we will be making knots with. 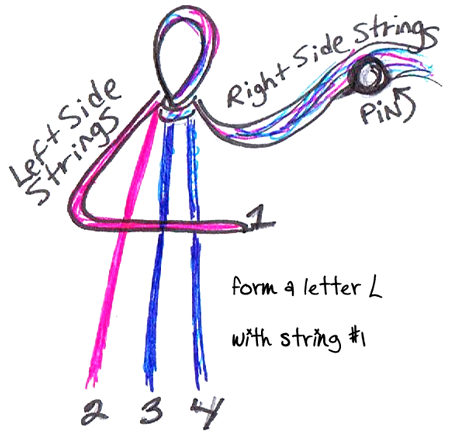 Form a letter ‘L’ with the pink string…as pictured above. Now tuck the pink #1 string under the pink #2 string and into gap between these 2 strings. You are making a knot. 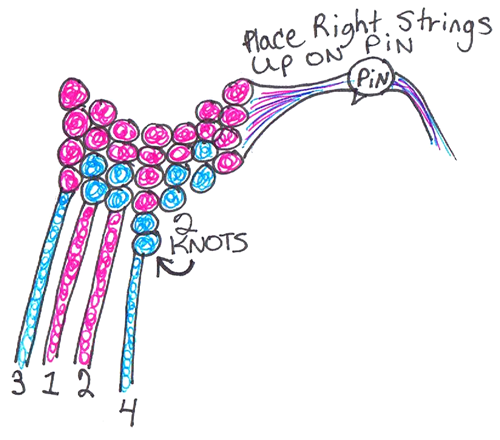 Think of the way that you tie a knot on your shoe lace, however in this case, always make sure the knotting string (Pink #1) goes over and then under the string you are knotting over (Pink #2) before pulling. 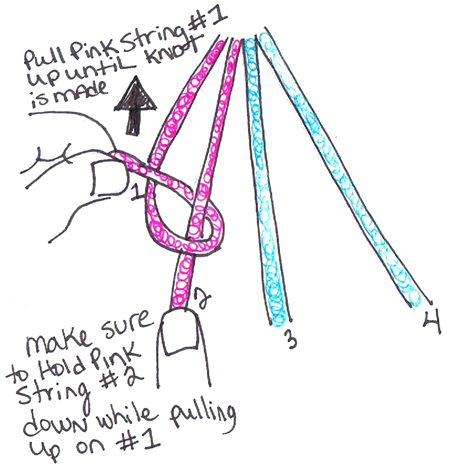 Now pull the pink #1 string up until a beautiful pink knot is made. 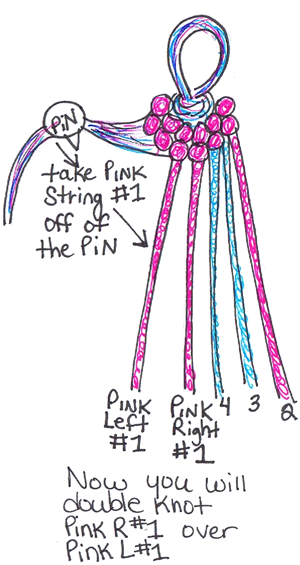 Make sure to hold the pink #2 string down, so the other strings don’t get in the way while pulling. You can see your first knot in the picture above. Do the same exact thing over again to make a double knot. 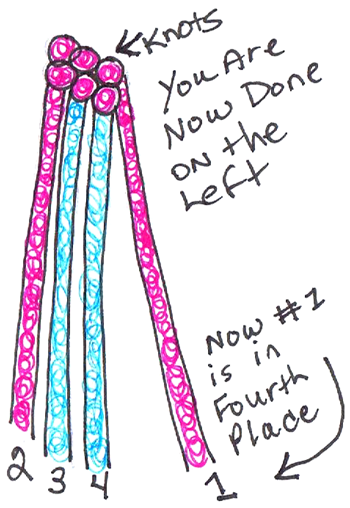 Notice that you made 2 pink knots on the top of the pink #2 string. Notice that the pink #1 string is now in place #2. Now we will knot the pink #1 string over the blue #3 string since it is next in line. 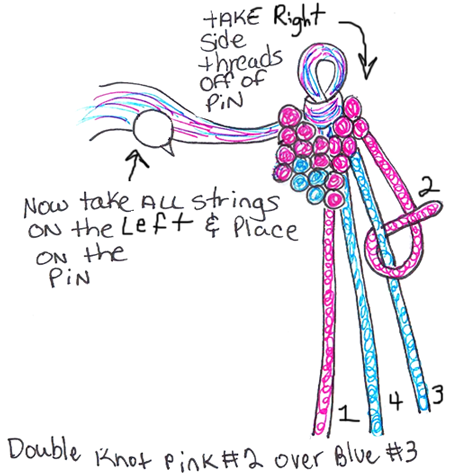 Knot the pink #1 string over the blue #3 string twice to make a double knot. 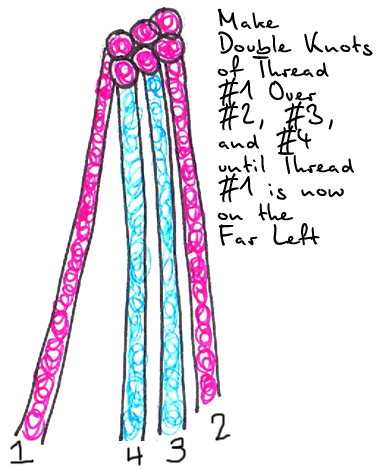 Now you can see that there are 2 pink knots on the blue #3 thread. 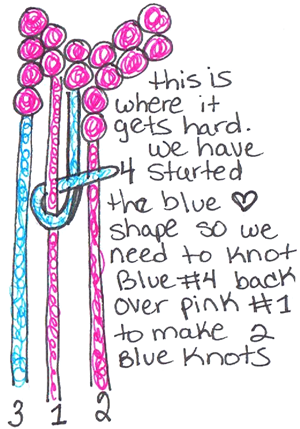 Now we will knot pink #1 over blue #4 thread since it is next in line. Make the 2 knots over blue #4. Now you can see the 2 pink knots on top of the blue #4. You can now see that pink #1 is now in the fourth place. 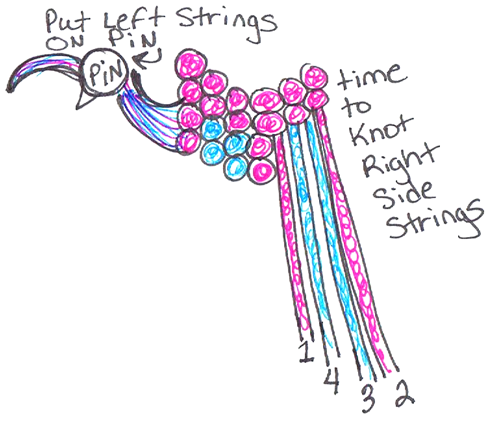 Now take all of the left-side strings and put them on the left pin to get them out of the way. Fan out the right-side strings in the correct order…in the mirror image that you created in step #9 of this tutorial. We will now be working on the right side strings. 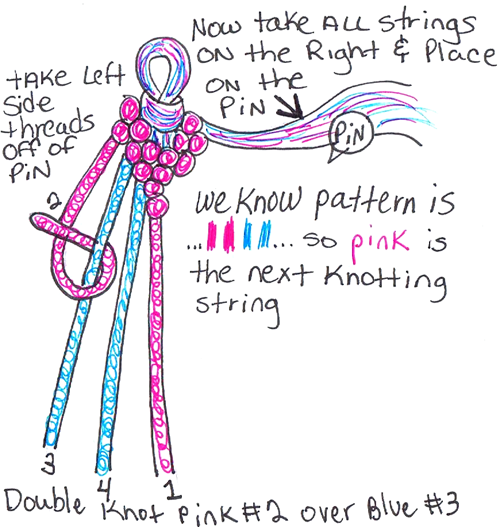 We will be knotting pink string #1 (just like we did on the right). 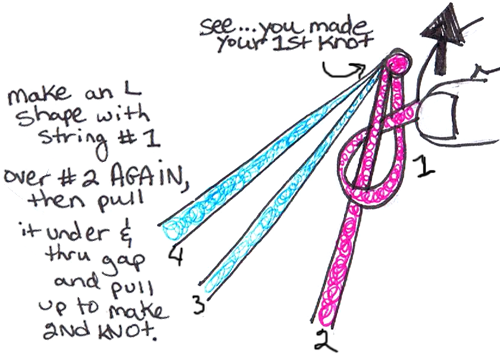 However, since we are working on the right side, when we make the letter L shape with the knotting thread (pink #1), the Letter L will be backwards…so just keep that in mind. 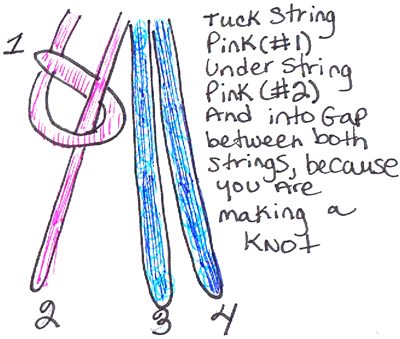 Tuck string pink #1 under pink #2 and into gap between both strings, because you are making a knot just like you did on the left side strings. 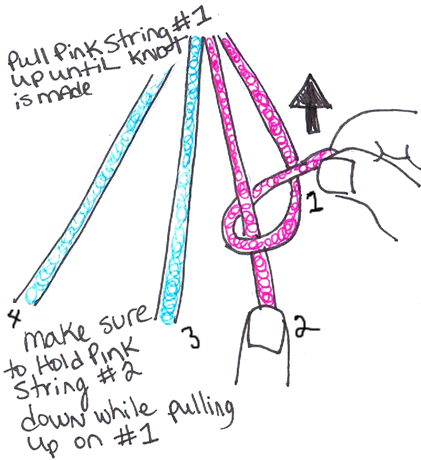 Now pull thread pink #1 up until a knot is made, while holding pink #2 down. 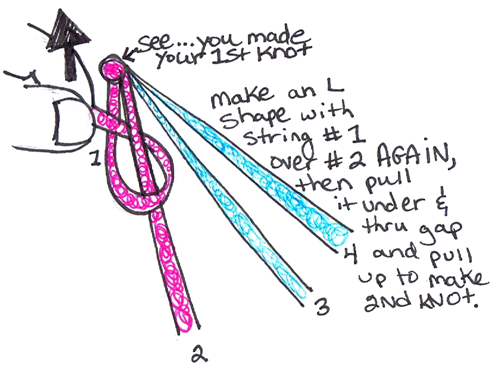 See, you made your first knot on the right side. Now make another knot to make a double knot. 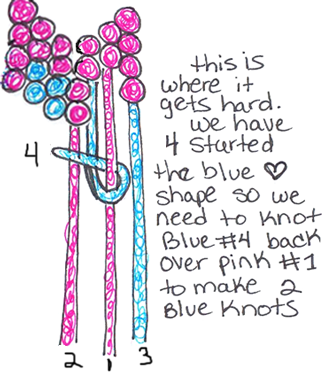 Now make a double knot with pink #1 over pink #2, blue #3, and blue #4 until pink #1 is all the way to the far left. This is just like you did on the left strings, but we are doing it on the right in the opposite direction(like in a mirror). 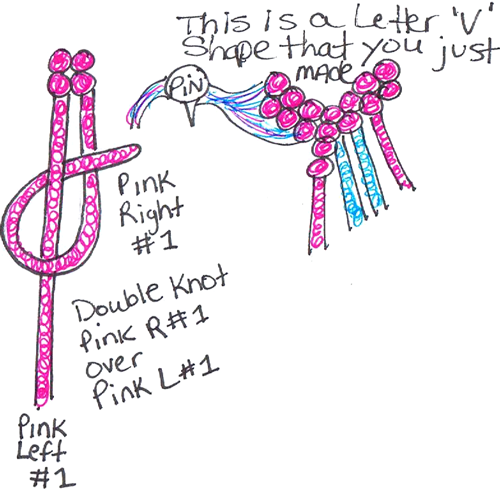 Now we are done with the right side and we have to knot the 2 pink #1 strings together in the middle to make a ‘v’ shape. 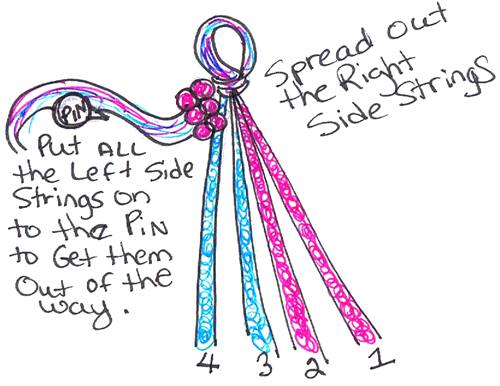 So Take pink #1 string off of the left side pin. 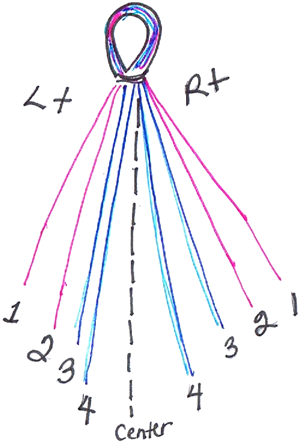 Then you will have 2 pink threads on the left (see pic). 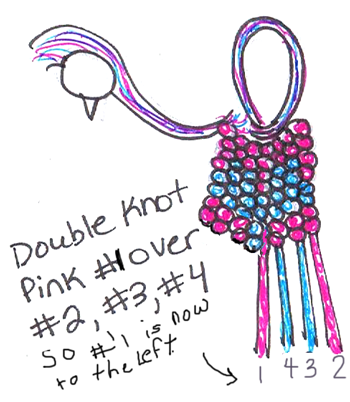 You will now double knot pink Right #1 over Pink Left #1. 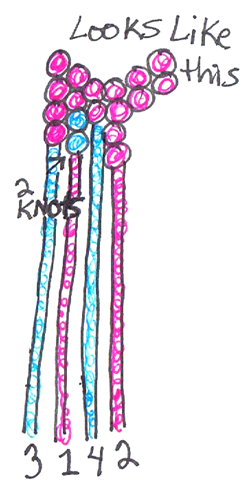 In the pic above, on the left, I show you the double knot process of the 2 pink strings. On the right, I show you the Letter ‘V’ shape that has been made. Now you will be putting all of the right side threads up on the pin and take down the left side threads to spread them out. 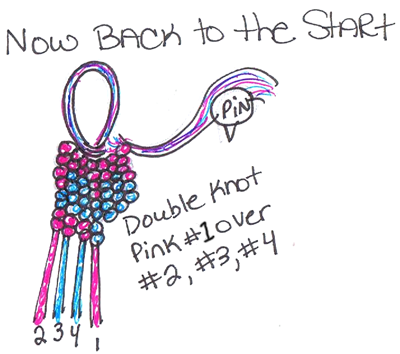 We will now use pink #2 as the knotting string. 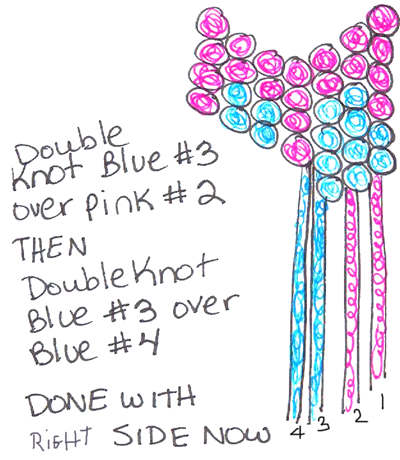 So double knot pink #2 over blue #3 thread. 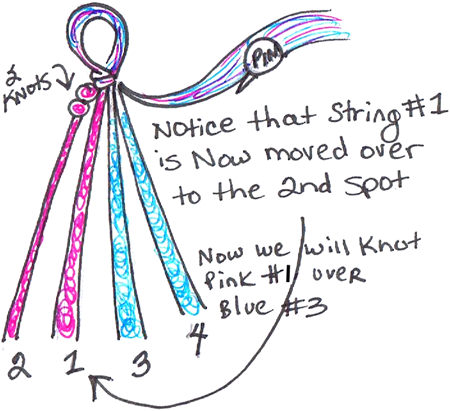 As you see, you have made 2 pink knots on the blue #3 string. 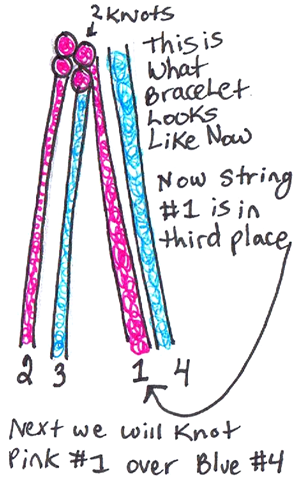 Notice that the pink #2 string has moved to the 2nd spot. This is where things get a little bit more confusing. We will be starting to make the blue heart now. 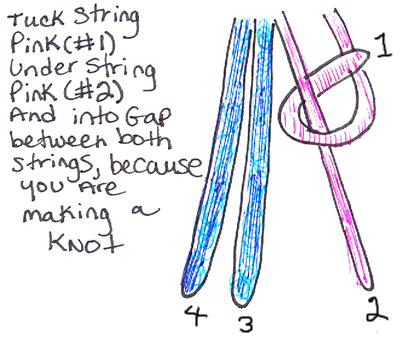 Take string blue #4 and knot it over the pink #1 string (by making a backwards letter L shape) to make 2 blue knots. Now you can see 2 blue knots on top of pink string #1. 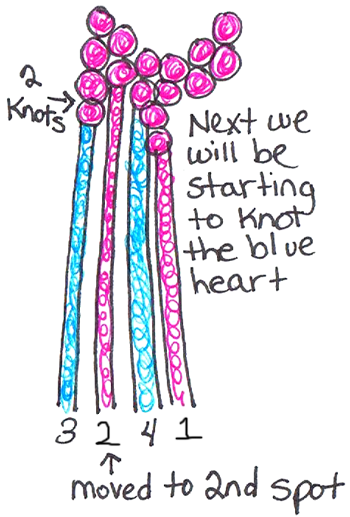 Now we will be knotting blue #4 over pink #2 to make 2 more blue knots. Now we will place all of the left side strings back on to the pin. We will be doing on the right side, what we just did on the left side. Fan out the right side threads. 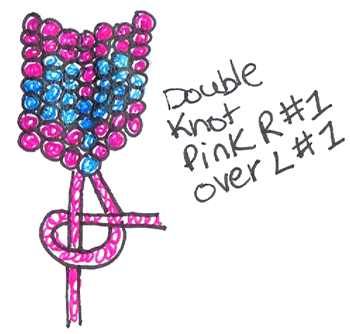 Double knot pink #2 over Blue #3. 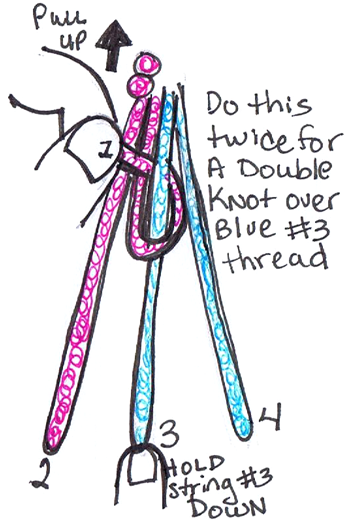 Now double knot blue #4 thread back over pink #1 thread to make 2 blue knots. 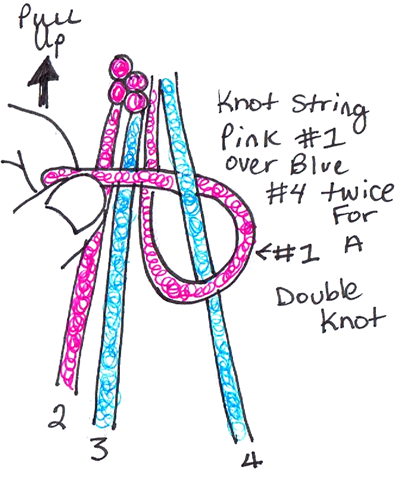 Now double knot blue #4 over pink #2 thread to make 2 more blue knots. Now take the Left blue #4 thread off of the left side pin. 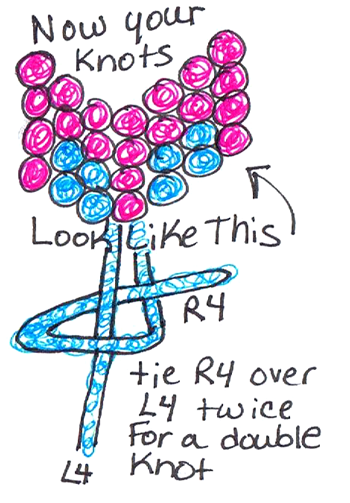 Now we will be double knotting Right Blue #4 over Left Blue #4 Thread. Now place the right side strings on the pin and fan out the left sided pins. We are working on the left strings now again. 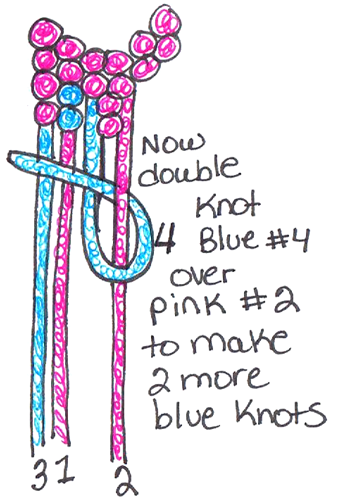 Now double knot blue #3 over pink #1. We know how to do this now, so I won’t baby you as much now. 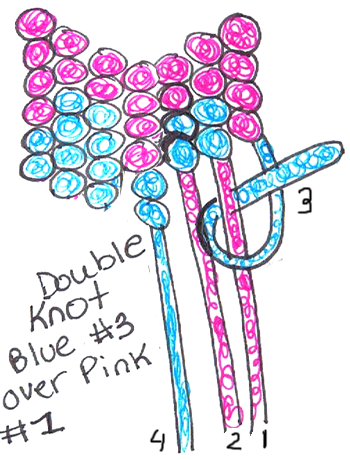 Double knot blue #3 over pink #2 and blue #4. You are now done with the left side again. Put left side threads up on pin. Take down right side strings and fan them out. 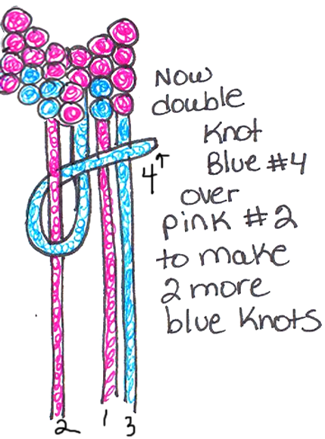 Now double knot blue #3 over pink #1. 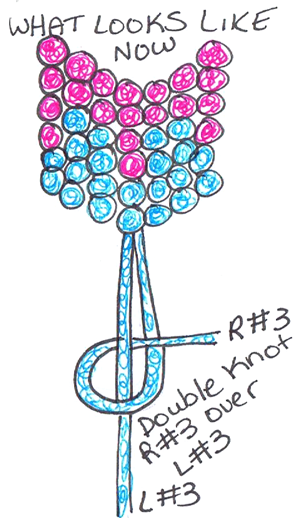 Double knot blue #3 over pink #2 and blue #4. 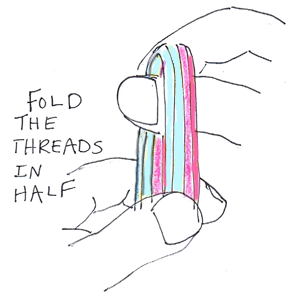 You are now done with the right side and it is time to tie the blue #3 threads together. Take the left side blue #3 off of the left side pin. Then double knot Right blue #3 over Left blue #3. Hooray! You made a heart shape. 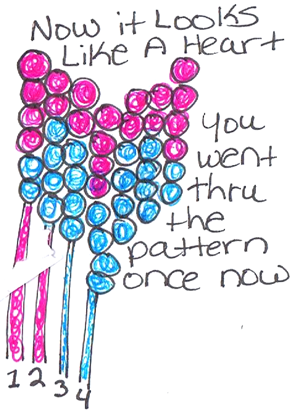 You went thru the pattern one full time now. 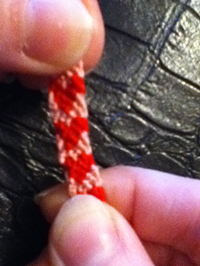 You should repeat the pattern until you are done with the bracelet. However, I will go thru part of the process quickly again. Put your right-sided threads up on the pin and take down the left threads. 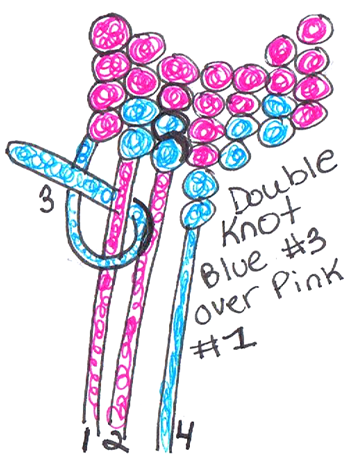 Double knot pink #1 over pink #2, blue #3, and blue #4. Pink #1 will now be on the far right. Now put the left strings on the pin and take the right strings down. 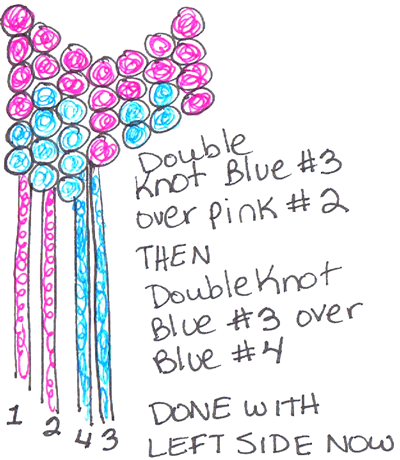 Double knot pink #1 over pink #2, blue #3, and blue #4. Pink #1 will now be on the far left. You will now go to Step 27 and continue over and over again until you have a bracelet long enough to cover your friend’s wrist. 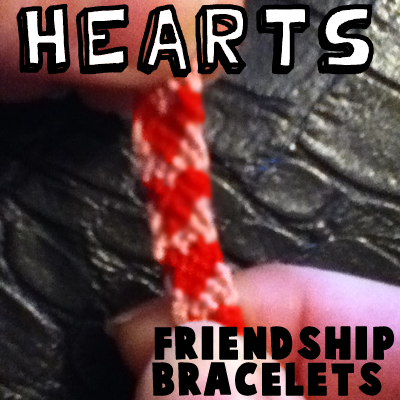 How did your Hearts Friendship Bracelet turn out? Any friend would be proud to wear a bracelet like this. Now, the real issue…. which friend are you going to give it to??? Hmmmmm…..